But when pour out, quite a lot jugak. The noodle doesn't looked nice. However, after the first bite..yum yum..really delicious. The soup was have just the right amount of spiciness and sourness. Hmm...next time wana try their Curry Laksa pulak. Looks nice... Not like shredded newspapers! Eyew...not a fan of Penang laksa because of the look! LOL!!! 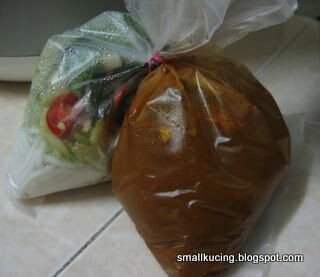 now lunch time..jom.. lets go laksa-ing now!!! 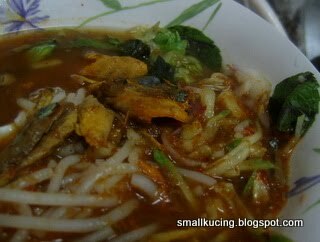 Small kuching knows how to eat laksa? oh that one ah.. I small small that time used to eat la.. now I prefer to cook myself coz I can see the 'fish' and not risking eating 'shredded newspaper' like what STP say.. Oooo...I love asam laksa, spicy and sour, so delicious! U pandai cook la. Me cook sure hangit one. "Kai sau ngap kiok" ...kakaka..
hehehe.. no la.. I will cook with 1 condition that I can to buy 'cheap' ikan kembong in the wet market...:D so, next time you want to eat hoh, go la buy ikan kembong to my house.. oh ya, not forgetting someone to 'skin' the pineapple also..
wah...can see the gravy very kao ler...the soup must be very tasty! ei..i also love it. next time if u go Ikano, go try Ah Cheng Laksa (near Guardian there, got a bakery shop one). The laksa is nice. Oh u like asam laksa? I seldom eat, coz those places that I always go buy food does not sell asam laksa. I love assam laksa too. Lau hao sui already now. 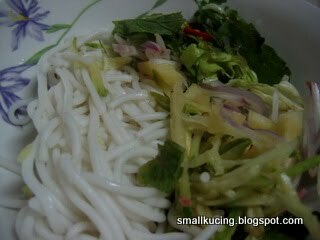 Small kucing also walloped the assam laksa? Mark is my favourite place for assam laksa. I love their curry stingray rice too! 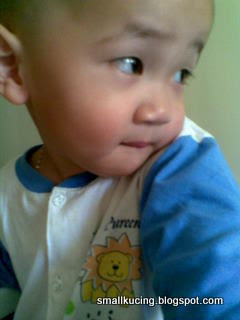 so shy like that, so cute!! Yum yum.. very appetising indeed. Last time when I was much younger, I dunno how to eat this and found it very yucky. Now, absolutely LOVE it! I love assam laksa too. For me, I will add extra chili padi, and extra shrimp paste, yummy!